« What Happened To Summer? The generation in Taneycomo just keeps rolling along. Mentioned in last report that they had not stopped generating over the past seven days except for six hours early Monday morning. No change. Generated through Thanksgiving Day and on through the weekend. Believe the projection for Monday is more of the same. Hopefully, there is some down time in sight as fishing has been pretty good. Weather is really not bad, especially for this time of the year. It is the end of November! High today should be in the low 60s; with tomorrow about the same but a possibility of showers. The rest of the week looks pretty good. Stan had Larry and his grandson Jacob on the water Friday. Larry is from Oklahoma and I think Jacob is too. Pretty cool Friday, around 45 degrees for the high. Worst part of the morning was the wind…again. Windy most of the morning with 25 mph gusts! The two did have a good day on the red midge and a dark roe egg pattern. For an eleven year old young fly fisher who had only fly fished a couple times before, Jacob did pretty darn good! Kept it up Jacob! Steve, from Iowa, took a half day float with Dana on Friday. They too had a good day on the red tunghead midge and a peach egg pattern. Saturday, Stan two his regular “after Thanksgiving” mother, Branda, and son, Brandon, out all day. Brandon is from Wichita and the family gets together in Branson every year, so the two of them spend some time fly fishing together. Weather was great, 55 degrees, sunny, and NO WIND! They did well on the dark roe egg pattern, red midge and primrose & pearl midge. 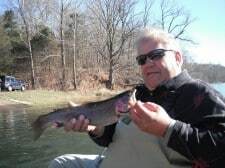 This entry was posted on Sunday, November 28th, 2010 at 11:03 am	and is filed under Fishing Reports. You can follow any responses to this entry through the RSS 2.0 feed. You can leave a response, or trackback from your own site.